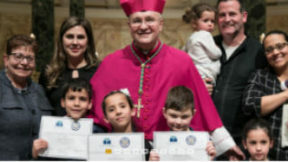 Home › News › Celebrate Catholic Schools Week! Celebrated since 1974, National Catholic Schools Week is the annual celebration of Catholic education in the United States. It starts the last Sunday in January and runs all week from January 27 to February 2. The theme for National Catholic Schools Week 2019 is “Catholic Schools: Learn. Serve. Lead. Succeed.” Schools typically observe the annual celebration week with Masses, open houses and other activities for students, families, parishioners and community members. Through these events, schools focus on the value Catholic education provides to young people and its contributions to our church, our communities and our nation.